Yep, while my old mom person has been laying around feeling bad, I have had the pleasure of trying out the great new line of Kong Treats! Just look at the array of loot that I got to sample! 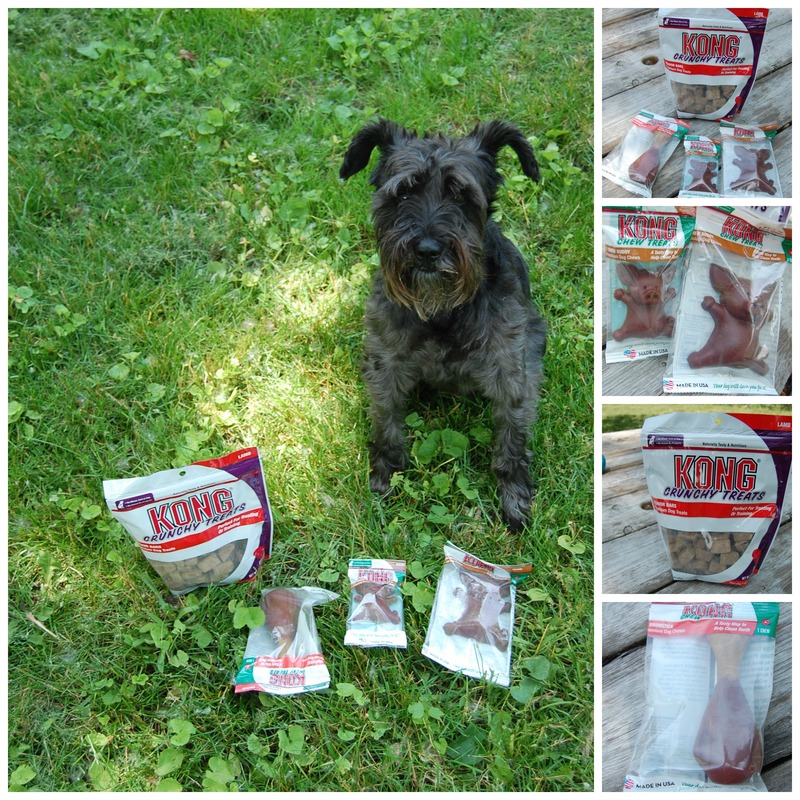 Here’s your chance to win a Kong Treats prize pack valued at $30 for yourself! Please follow along with the Rafflecopter below. Sorry international friends, this giveaway is open to US only. I liked the meat stix! You lucky dog! those look fantastic. We think we have them at our local pet shop. We’ll have to look. Oh I would love love to have that!!! I can taste it now. Prayers for your mom person. Wesa always up for foodable giveaways. The Slimmer Pugs recently posted..Benny’s Buddies Raffle Part Deux–Day Two–A new item to get a raffle ticket for and update on raffle purchases!! Heard your Mommy was sick. Hope her is feelin all better now. We hope that your mom person is feeling better and that the Dogtors have Solved the Mystery sickie. THAT looks like a super snack buddy. Good luck to all pups in U.S.! And I hope your mom person feels better soon, Oskar. Have a great Monday! I am sending prayers to your Mom person Oskar!!! It is no fun to feel bad!!! Bless her heart!!! I would love to get my dog the KONG Chew Buddies Bacon chew treat shaped like a pig! It is so cute! I like the meat treats! 🙂 or at least my dogs do! Wows, how pawsome is that drumstick???!!! It sure looks delish Oskar!! Oh, I’m droolin’ all overs Ma’s foot just thinkin’ abouts it! I’ve been keepin’ my paws crossed for your Moms. I sure hopes those Peep Docs figure outs what’s goin’ on…. I would love those Natural Chicken Jerky Strips. 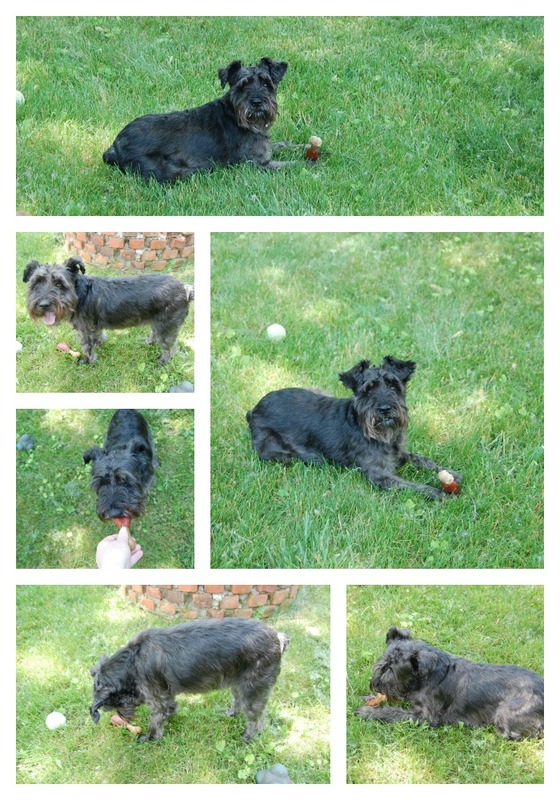 Kjelle Bus aka Charlie Rascal recently posted..Jag satt ute i …..
Love the photos of you enjoying the KONG treats! High Paw! (I won’t enter the giveaway because I am already getting some. I want other pals to have the chance to taste them.) I hope your mom feels better soon. We’re so sorry to hear about your Mom Person’s recent sickies…we really hope that she is feeling much better now. Oh! I don’t know if you saw on my blog but we’ve got some exciting news – my human, Hsin-Yi, is launching her 1st ebook in Sep – it’s a canine mystery featuring a Great Dane & her friends tackling deadly enemies, puzzling riddles and an Ancient Egyptian curse as they race to solve the mystery of missing puppies. It’s aimed at 9 – 12yrs+, plus teens & adults who are dog lovers. Anyway, here is the link to the post with the cover designs. Honey the Great Dane recently posted..Help choose a cover for the Big Honey Dog mystery novel! We sure hope your Mom Person feels better soon, Oskar. Please give her some love from us, okay? meowmeowmans recently posted..Friday Fun with Sheba! We love all things KONG!!! Bet those treats are very yummy. We have been away for a bit, but we are hoping your Mom is feeling better. Hope the doctors were able to help her. Oh Oskar – that treat package soundz sooooooo furry much yummy. We wood love tue haf sum. Oh an’of course we wood love that Drumstick chew or thoze Buddies Bacon iz also furry much cute an’lookz REAL tasty. I love KONG treats Oskar so sign me up! Gizmo (@GizmoGeodog) recently posted..Let’s Go Geocaching for Geodog Day! OMD Oskar what a PAWSOME job to have to do – can I help???? Mama’s not sure she did this right … but we love Kong treats. We had them for the first time at Christmas when Santa left them in our stockings! OMP (Oh My Pug) they are wonderful! my doggie loves the dental chews! Kofi my puppy loves playing with his kong! Mu Doggie ‘Happy’ Loves the Stuff’N Treats that he has to work for to get! Carrie Davis recently posted..3-2-1 Cake Recipe! We love Kong dental treats because dental health is so important! Hey, Oskar, that’s quite a bunch of yummy treats for you. Hope you enjoy them! And, we wanted to come by with our thanks for your comforting words (thank your mom, Pam, too) when we lost Tom. He’ll stay in our hearts and I know he’ll help us with the blog. I’m glad you got some cool treats to keep you busy so your mom can get better soon! Sissy’s favorite is the buddy’s bacon. How cool is this! We hope our mommy did this right. REALLY hope we win! We like the on/off squeaker toys! we like the buddies bacon kong chews. We love KONG Treats! Luna has never tried the chew, but I bet it is awesome! Beagles and Bargains recently posted..Product Review: VetIQ Offers Affordable Treats and More! My dogs LOVE the Buddies, but I would love for them to try the drumsticks. 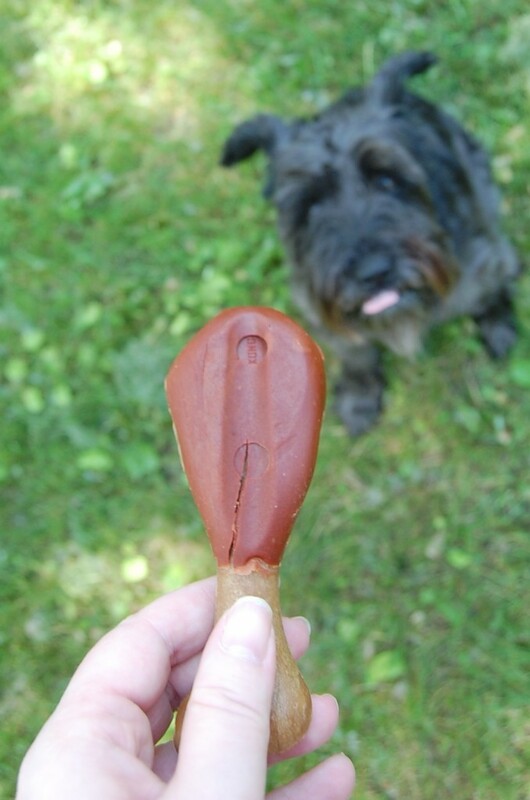 My pup loves Kong treats and would love to try the drumsticks. My dogs love the Drumsticks! Koby loves the Ham Shank chew! Oh I hope to win!!! Will review and refer to this contest on my new blog if I get the opportunity. Woof!